A Little Book of Songs and Ballads: gathered from Ancient Musick Books, m.s. and printed is a Victorian anthology of collected songs and ballads taken from early printed books and manuscripts from the Medieval and Early Modern eras. The book was published in 1851 by John Russell Smith (4 Soho Square, London), and compiled by Edward Francis Rimbault. This copy of the book is currently housed in the University of Victoria's Special Collections Library. It was acquired in 1988 by the University and donated by Dr. Charles Haywood. The Haywood collection also boasts another Victorian ballad anthology, The English and Scottish Popular Ballads (1882) by Francis James Child. A Little Book of Songs and Ballads is a portable, modestly sized book (12 x 19 cm), rich in a diverse range of seventy-four medieval and early modern musical literature texts taken from broadsides and manuscripts. Readers of this book may easily open to any page and find a relatively short, medieval song or ballad and acquire relevant information to the particular passage. The diversity of genres is evident in the book as there are humorous songs ("The Ape", "The Monkey and the Baboone"), child rhymes ("The Ballad of the Fox"), political verse ("Ballad on the Marriage of Margaret Tudor"), and even country songs ("The Rural Dance About the May-pole"). Dr. Rimbault helpfully equips each entry in this anthology with a concise preface. His introductions typically state where the text was found, its known provenance, who it was written by and for, and the main subject matter. 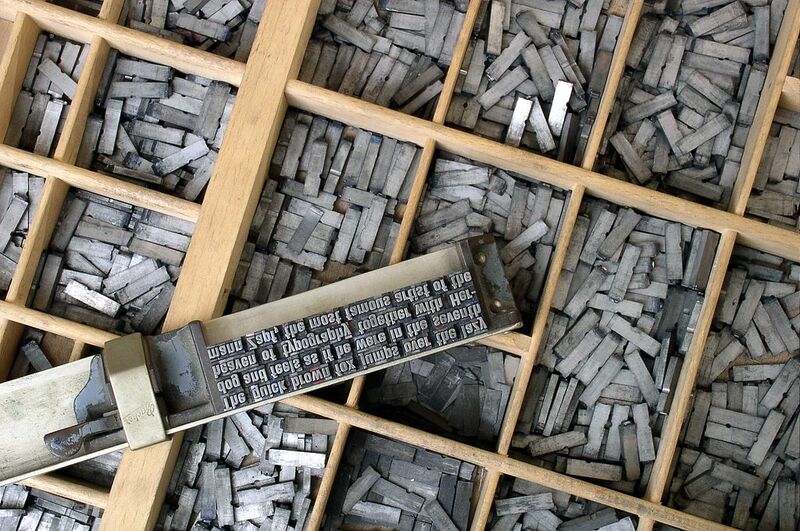 The ease of reading through this book is attributed to the simple layout of this format. Most of the introductions are accompanied by a note that the chosen song or ballad is from a manuscript "in the editor's possession," exhibiting Dr. Rimbault's impressive collection and obvious passion for musical literature. There are three key features of this book that make it unique and characteristic of its time. Firstly, it is an anthology. As the "growth of affordable publishing" in the 1820's gave rise to increasing literacy, poetry anthologies or "giftbooks" became very popular in the nineteenth century (Houston 366). Secondly, the book is an anthology concerning itself with songs and ballads. It is a great example of the ballad revival that was sparked in 1765 by Thomas Percy's Reliques of Ancient English Poetry, a source with which Rimbault was most familiar. 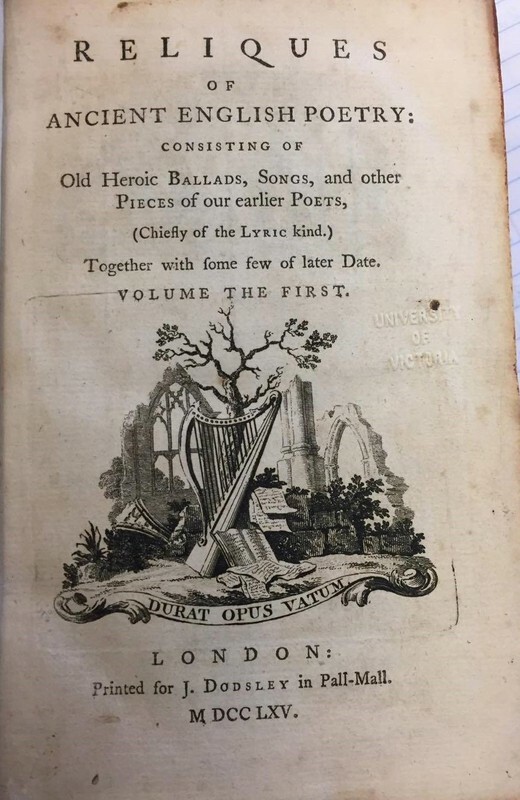 Finally, and more specifically, A Little Book of Songs and Ballads is focused on providing readers with rare, medieval and early modern material, which is characterized on the title page as "ancient." Victorian attraction to medievalism is discussed by Antony Harrison in the Blackwell Companion to Victorian Poetry. 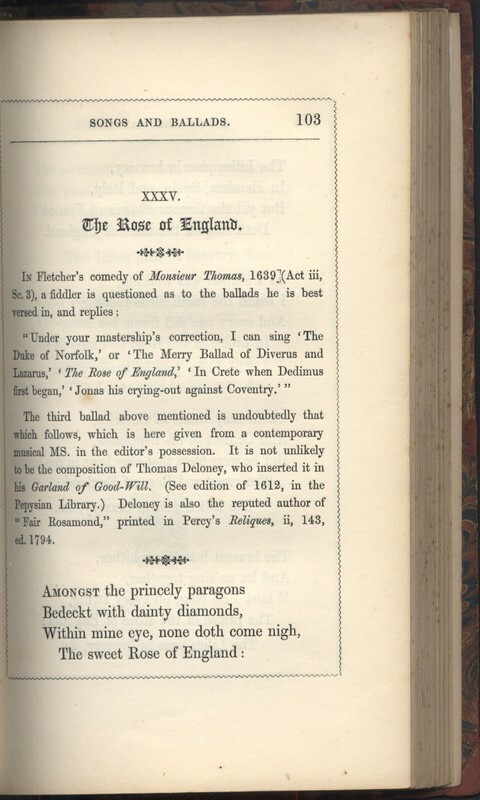 He notes that "from the late eighteenth century onward, [there was] a strong interest in medieval history and all things medieval" which was "characterized by a specialized vocabularly, a distinctive iconography and the use of particular genres" (246) of which ballads and lyrics were the most popular. Now cheaply bought for thrice their weight in gold." Viewing this quotation as a symbol for the book itself is beneficial in understanding the book's purpose and role. By providing middle-class readers with rare material that they otherwise never would have been able to discover, Dr. Rimbault situates his book within the rising literacy and educated populace of the nineteenth century. The catalogue of Dr. Rimbault's libray content. Dr. Rimbault was an accomplished figure in the music and literary cultures of the nineteenth century. He grew up under the musical guidance of his father Stephen, who made his living as a composer, music arranger, and organist. Dr. Rimbault had a clear interest, talent and passion for music at an early age and was appointed organist at the Swiss Church in Soho, London when he was only sixteen (ODNB). During his lifetime, Dr. Rimbault worked as an editor for the Motett Society, and edited publications for the Camden Society, and Handel Society, and he was secretary of the Musical Antiquarian Society and the Percy Society (both of which he co-founded in 1840). 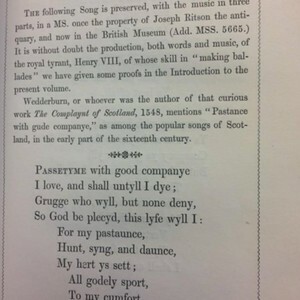 In particular, the Percy Society was hugely influential in the production of A Little Book of Songs and Ballads. The society played a vital role "in the rediscovery and popularization of ballads and folksongs" (Gregory 97), which is perpetuated and evidenced by Dr. Rimbault's book. Dr. Rimbault's expansive knowledge of early music and musical literature showed him to the public as an expert, which helped him to receive academic offers and opportunities. He was given an honorary LL. D. degree from Oxford and a Ph.D. from the Stockholm Academy of Music, and taught the history of music at the Royal Institution (ODNB). Dr. Rimbault's well-known and respected expertise was widely recognized, and he was offered a professorship at Harvard University (which he declined for unknown reasons). Apart from his various career highlights, Dr. Rimbault married and had two children. He was "famed for his great library" (Andrewes 30), and there is a copy of the catalogue of his library's collection housed in the University of Victoria's Music and Media Reference section. A Little Book of Songs and Ballads is emblematic of Dr. Rimabault's passion for music and literature. He was "a collector of old music manuscripts" (Gregory 147), and the majority of the entries in his book were taken from his personal collection. There is a general introduction at the beginning of the book that explains Dr. Rimbault's insight in its production. He notes that unlike some other ballad anthologies, his does not focus on one or two specific genres. His anthology "'Tis but a collection of 'diverse' scraps, gleaned from a variety of ancient Music Books both manuscript and printed" (19-20). The impression that is gathered from these words is that A Little Book of Songs and Ballads is certainly not meant to be read as a studying tool, but is more of a miscellany which incorporates varied subject matters and genres intended for broadening a common reader's knowledge of medieval musical literature, for pleasure. 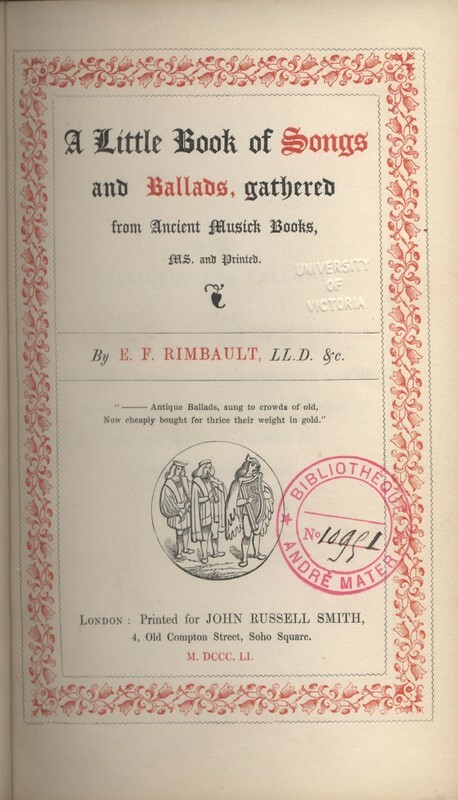 Dr. Rimbault also states that the songs and ballads are mainly "from new and independent sources" (20), although some of the works have been edited previously in other books or anthologies. As mentioned above, Dr. Rimbault collected a majority of the book's entries from his own library, and many more were found in the libraries of similar prominent literary and music scholars of the time, including Joseph Ritson and Sir John Hawkins. Finally, Dr. Rimbault ends his introduction by asking the reader to remind themselves that this is not an overly serious or scholarly book - it should be used for "amusement of a passing hour" and that his efforts towards producing the book were done "neither 'to good nor to harm'" (20). This book was not meant to be used for critical studying or intensive scholarly conversation. The general introduction and the book's format attribute to this. The lack of critical notes and easy to read layout are good indications that this book was aimed towards the so-called "average" or "middle-class" Victorian who had enough money to buy fairly priced texts (like this one), but could not afford to purchase grand and luxuriously decorated books. Although Dr. Rimbault makes it evident in his introduction that the collection of songs and ballads does not conform to one particular genre, it is still useful as a student of this book to take a deeper look at one entry. The Kynge's Ballade, otherwise known as Passtime with Good Company, is the (aptly enough) eighth entry in the book, and begins on page thirty-seven. This ballad is "without doubt, the production, both words and music, of the royal tyrant, Henry VIII" (Rimbault 37). The manuscript was originally in the possession of Joseph Ritson, and first printed in his Ancient English Songs. At the time of A Little Book of Songs and Ballad's publication, the manuscript was stationed in the British Museum (MS Add. 31922), where it is still held today. It was written by Henry VIII around the beginning of his reign, and it became one of the most popular songs during the first part of the sixteenth century in both England and Scotland. It is believed to have been written for Henry's first wife, Catherine of Aragon, although this opinion has yet to be proven. Despite the modern, established view of Henry VIII as a ruthless, bloodthirsty, and volatile monarch, there was more to the King than negative associations. In his younger years as a ruler, especially, Henry was seen as amiable and talented in many artistic areas. He spent the majority of his time hunting, playing sports, singing, dancing, and making ballads. Henry was particularly fond of composing his own music and lyrics, and had the skill to produce quality art. Dr. Rimbault mentions in his general introduction that "Henry was undoubtedly skilled in the art of practical composition" (13). In his A Brief Introduction to the Skill of Musick published originally in 1667, John Playford explains that "King Henry the Eighth did much advance Musick in the first part of his Reign, when his mind was more intent upon Arts and Sciences". Henry did, in fact, produce many songs and ballads, some of which are included in A Little Book of Songs and Ballads. Dr. Rimbault certainly believed that Henry's capacities as a composer of music and lyrics were enough to be featured in his ballad anthology three hundred years later. are the exercises that provide his enjoyment. The literary sentiment of idleness as a detrimental quality in life is a common notion in medieval literature, and so is not particularly original or unique to Henry. However, Victorian interest in medievalism and medieval literary tropes make this ballad a discernible choice of inclusion in Rimbault's book. This extremely brief imitation of The Kynge's Ballade is from an Interlude entitled The Nature of the Four Elements, written and printed between 1517 and 1519. Dr. Rimbault remarks that this short text "has entirely escaped the notice of our musical historians", a disappointing fact considering the imitation was "the earliest instance of a printed partition in [the] kingdom" (39). 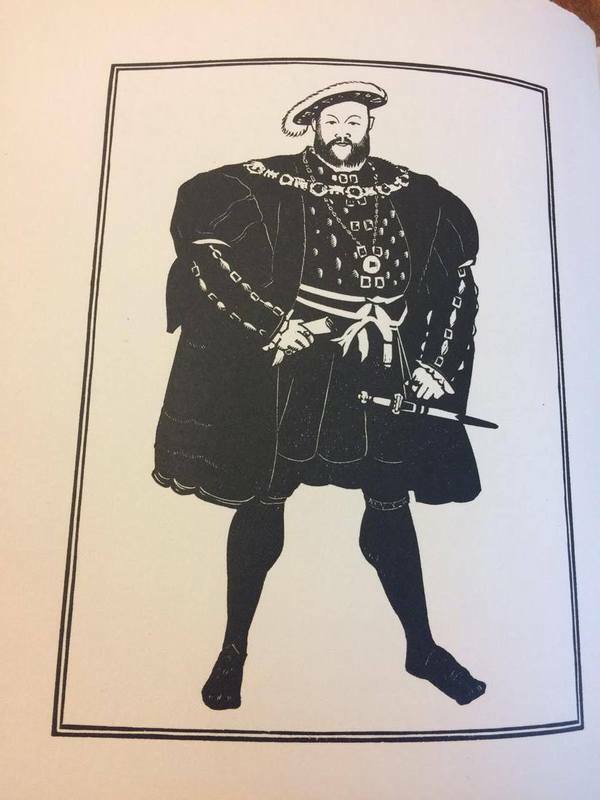 The Kynge's Ballade is present in another book within the Special Collections Library at the University of Victoria - The Miscellaneous Writings of King Henry VIII (1924), where it appears on one full page in modern English. The University of Victoria's Special Collections Library is fortunate enough to have a first edition copy of the influential Reliques of Ancient English Poetry by Thomas Percy. Percy's Reliques "is the pivotal document of the ballad revival" of the nineteenth century (Friedman 185) and A Little Book of Songs and Ballads was doubtless influenced and modelled to an extent after Percy's work. Dr. Rimbault was well acquainted with Percy's Reliques. One of his most impressive publications, Musical Illustrations of Bishop Percy's Reliques of Ancient English Poetry (1850) intimately details the musical components of the lyrics found in Percy's work. The Percy Society itself (of which Rimbault was secretary and co-founder) was named after Thomas Percy, and "had the express purpose of encouraging research into old music and literature, sharing ideas and information on these subjects, and financing the printing of hitherto un-published primary documents" (Gregory 97). 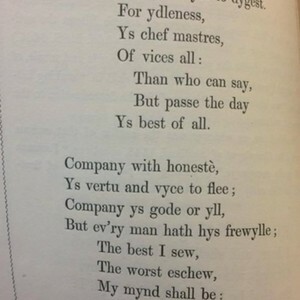 The aims of the Percy Society are correlated with the purpose and contents of A Little Book of Songs and Ballads. While Dr. Rimbault's book was influenced greatly by Percy's work, the two texts are different from each other in terms of their book's intended purposes. Percy's book was meant to be a critical collection of antiquary ballads, and so he adopted a much more intense editorial role than Rimbault. The songs that he included had to be made "complete, clear, and readable" to the modern reader which enacted the majority of Percy's "textual manipulations" (Friedman 205) to the ballads he included. A Little Book of Songs and Ballads does not take this intense critical approach, and impresses upon its reader a more leisurely glimpse of rare songs, rather than a deep discussion of them. In his general introduction, Dr. Rimbault dedicates several pages to explaining the medieval minstrels, and essentially says the same things of them and their importance as Percy does in his chapter "Essay on the Ancient Minstrels in England." "The reader here is presented with select remains of our ancient English Bards and Minstrels...[who] contributed to soften the roughness of a martial and unlettered people by their songs and their music" (Percy ix). The minstrels' "disposition to hilarity and merriment which they appear to have possessed, would naturally lead them to the composition of gay and lively melodies" (Rimbault 7). Rimbault also mentions his agreement with Percy's viewpoint that the minstrels "united the arts of poetry and music" (3). The two authors present the minstrels as the major sources for manuscripts and printed pages origins of songs and ballads, and Dr. Rimbault models his comments on the minstrels' importance to his book just as Percy did. Andrewes, Richard. "Edward Francis Rimbault, 1816-1876." Fontes Artis Musicae, vol. 30, No. 1/2, 1983, pp. 30-34. Friedman, Albert B. The Ballad Revival: Studies in the Influence of Popular on Sophisticated Poetry. The University of Chicago Press, 1961. Gregory, David E. Victorian Songhunters: The Recovery and Editing of English Vernacular Ballads and Folk Lyrics, 1820-1883. The Scarecrow Press, Inc., 2006. Harrison, Antony. "Arthurian Poetry and Medievalism." A Companion to Victorian Poetry, edited by Richard Cronin, Alison Chapman and Antony H. Harrison, Blackwell, 2002, pp. 246-261. Houston, Natalie M. "Anthologies and the Making of the Poetic Canon." A Companion to Victorian Poetry, edited by Richard Cronin, Alison Chapman and Antony Harrison, Blackwell, 2002, pp. 361-377. King, A. Hyatt. 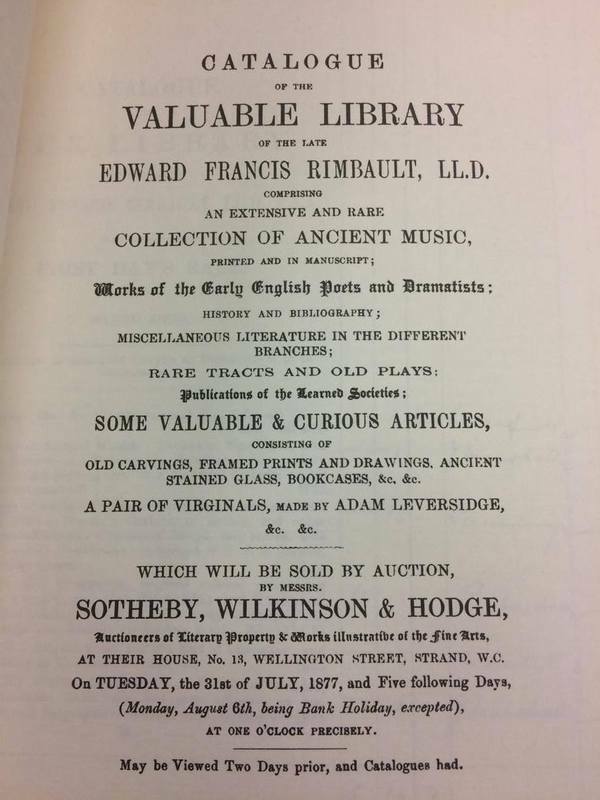 Catalogue of the Music Library of Edward Francis Rimbault. Frits Knuf Buren, 1975. Legge, R.H. and rev. Richard Turbet. "Edward Francis Rimbault." Oxford Dictionary of National Biography, 2005. Macnamara, Francis, editor. Miscellaneous Writings of Henry the Eighth, King of England, France and Ireland. Golden Cockerel Press, 1924. Percy, Thomas. Reliques of Ancient English Poetry: consisting of old heroic ballads, songs, and other pieces of our earliest poets. J. Dodsley, 1765. Percy, Thomas. Percy's Reliques of Ancient English Poetry, vol. 1. Edited by Ernest Rhys, J.M Dent & Co., 1908. Playford, John. A Brief Introduction to the Skill of Musick: in three books. 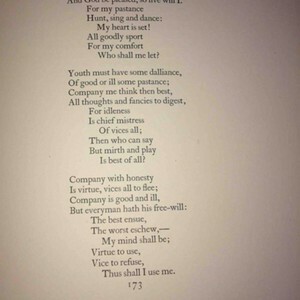 John Playford, 1667. Rimbault, Edward Francis. A Little Book of Songs and Ballads: gathered from Ancient Musick Books, m.s. and printed. John Russell Smith, 1851. Rimbault, Edward Francis. Musical Illustrations of Bishop Percy's Reliques of Ancient English Poetry. Norwood Editions, 1973. Call Number: PR 1187 R5. Rimbault, Edward Francis. "The Songs and Music of the Court of Henry VIII. The Leisure Hour: A Family Journal of Instruction and Recreation, ed. James Macauley, Bouverie St., 27 March 1875, London, pp. 203-206.